If you've been on the fence about buying that brand new 2015 Audi A3, this might help you make your decision. The new A3 will come with six months of 4G LTE connectivity for FREE. Just like your smartphone, the A3 will be able to connect to the internet directly. The navigation system will work off of this connectivity. Audi Connect will give you access to additional internet-based features too. This makes the 2015 Audi A3 the first standalone "connected car". - Wi-Fi Hotspot: Your car turns into a hotspot for up to 8 devices giving passengers internet connectivity. - Google Earth: Integrated maps through Google Earth means high resolution mapping with 3D terrain and aerial images of your route with more realistic views. - Google Voice Local Search: Use your voice to search POIs or just about anything locally. - myAudi Destinations: You can use Google Maps in any browser to send favorite destinations directly from your computer or web-enabled mobile device to your myAudi account. These can then be accessed from your car. - Parking: Find the best available parking spot in most cities with included pricing information and navigation to the parking garage entrance. - Weather: Up-to-date weather information for the current day and a three-day forecast. 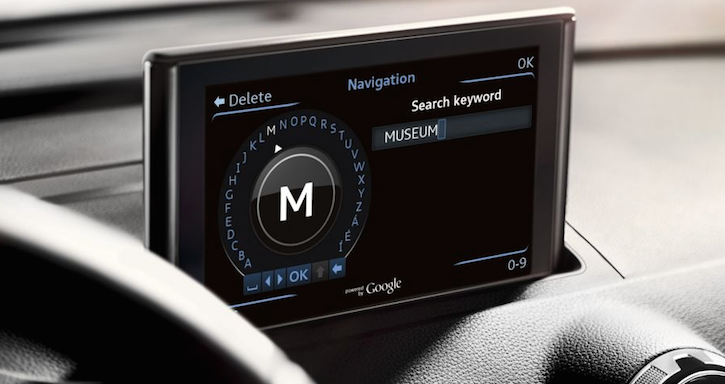 - Audi Music Stream: Access more than 7,000 web radio stations through the Audi MMI connect app. - Picture Navigation: Program a destination by selecting a picture uploaded to the vehicle. The system uses geo-coordinates embedded in the picture to program the destination. All features of Audi Connect are available with connectivity provided through a service partner. The 2015 A3 Sedan will connect through AT&T. All other vehicles including the A4, A5, allroad, A6, A7, A8, Q5 and Q7 will connect through T-Mobile. All new vehicles come with complimentary six-month trial period. The 2015 Audi A3 starts at $29,900 and comes in three trims; Premium, Premium Plus, and Prestige. For full details visit Audi's website.